“I don’t just seek justice. I stalk it.” It’s so very important that Misty Knight spoke those words on Luke Cage. The TV series featuring Luke Cage comes during a long, painful procession of black people dying from bullets fired by police who are supposed to protect them. The series doesn’t feature an overtly political storyline but, nevertheless, much has been made of the fact that Luke Cage’s status as a bulletproof black man makes the Marvel Comics character an instant symbol. The symbolism accruing around Cage in this moment comes from wish fulfillment, an aggregate desire for a near-invulnerability that would let people get back up after being shot. Am I Going to Write About Murdered Black People Forever? But Misty Knight embodies a more fraught sort of symbolism. Most of the character’s comics history happens after she left the police force and became a private investigator. On the Luke Cage TV show, she’s a cop who hails from and works in Harlem, a community whose relationship with police has been historically volatile. 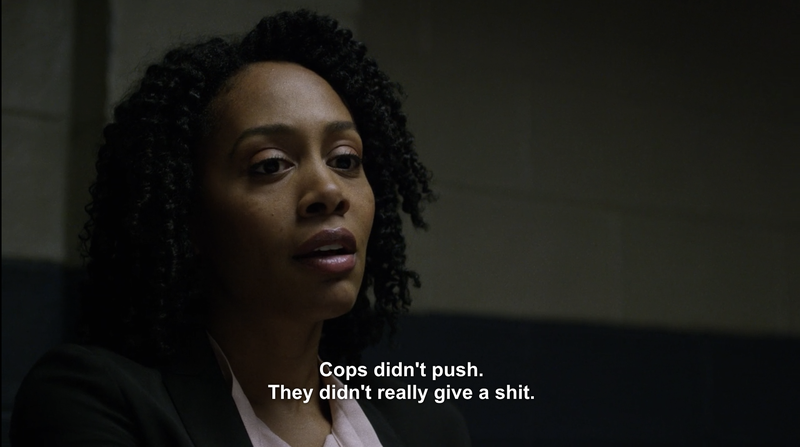 Throughout the series, Misty’s dialogue shows that she understands black folks’ reasons for distrusting the men and women in blue. It becomes apparent that she became a police officer to serve her community better, because Misty knows what the job looks like when it’s done wrong. In the episode spotlighting her, viewers learn that she has firsthand knowledge of how those most in need of correctly executed police work don’t get the benefit of that service. The “Misty vision” that the character uses to parse through crime scenes and parse causalities isn’t just a cool gimmick. It’s a signifier that transforms her into a keeper of personal and institutional histories; her special insight is fueled by knowing how those histories can tragically impact each other. She’s the best reasons for community policing made flesh. Luke Cage might be the super-strong hero of the show, but he works outside the legal system. His vindication only happens because Misty is a cop who believes in his innocence and potential for good. He briefly gets to experience a fuller humanity because one cop stops others from trying to lock him up or shoot him down. Luke Cage can’t exist in the real world but cops like Misty Knight can and do. This version of Misty may not have a bionic arm like her comic-book counterpart does but she’s got a strength of purpose that’s a sorely needed reminder of what a good cop can mean to the people they protect.